AT THE MARSEILLE FAIR: 12 DAYS TO SELL EVERYTHING… AND ANYTHING ! 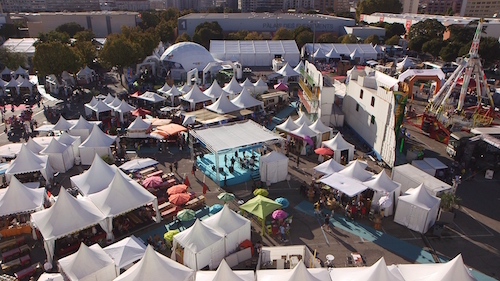 The Marseille International Fair is the main event of the 2018 back-to-work season. Like every year, there will be more than 300,000 visitors coming from all over France to buy everything… and especially anything. If you go for the latest gadget, there’s an embarrassment of choice. This is the second biggest Fair in France, a world within a world! Over more than 35 acres, right in the heart of Marseille, 1,200 exhibitors are rolling out the red carpet… and with good reason. In the age of easy Internet shopping, they have to be as inventive as possible in an effort to rival the Amazon monster. Soft toy hot water bottle, seaweed bathmat, extending watering hose, heart-shaped WC brush in every color… this year, the peddlers have to pull out all the stops to attract the customers. The Marseille Fair represents more than 30% of their annual turnover. Visitors also come to discover the latest prize-winning inventions from the Lépine Competition in Paris. 5 Gyro Gearloose types will be fighting to pitch their wacky gadgets to customers: barbecue-style Swiss Army knife, soap handle, bracelet hook… all hoping they will become essentials for the French! It’s not easy when competing with the peddlers, especially if you’re not a born salesman. But, above all, the Marseille Fair is the place to transform your home dramatically. Swimming pool and pergola manufacturers have caught onto that. A horde of seasoned salesmen will have no qualms in selling their extravagantly priced products, over 20,000 Euros for certain of the latest conservatories. And they have a motivation: most of them have had to pay over 10,000 Euros to rent a site measuring a mere few square meters. Being at the Marseille Fair comes at a price and emerging as a winner takes some work !